COLUMBIA FALLS, Mont. - Surrounded by mountain forests that stretch 80 miles north to the Canadian border and 120 miles east to the Great Plains, this town grew from the seeds of logging. And in contrast to neighboring communities like Whitefish, which now depend on tourism generated by Glacier National Park, Columbia Falls remains a timber town. Plum Creek Timber Co., with three local mills, is still the largest employer in this town of 5,000. But even here, times have changed. Almost every timber sale proposed on the Flathead National Forest is challenged by conservationists or by new homeowners who would rather look at trees than stumps. Because lawsuits and environmental studies cost the Forest Service a lot of money, the Flathead National Forest has all but scrapped its small timber-sales program over the past decade. That discomfits local loggers like Jack Jay and Floyd Quiram. Jay and Quiram are well known in this community for their good work and knowledge of the land. They have both hired out with local timber companies, private landowners and the state. But as small timber sales have dwindled, their livelihood has tumbled. A few years ago, Jay went looking for some kind of substitute for the small-sales program. "I was concerned about the industry for our kids," he says. The pair began meeting with timber advocates and academics about coaxing environmentalists to sit down with them. "We went one-on-one or two-on-two over cups of coffee, working out the basics," says Jay. "We started with low-key meetings, gradually increasing in size." What they discovered was simple: Loggers wanted work, while environmentalists wanted healthy forests. Jay and Quiram eventually pulled together a diverse group under the banner of the Flathead Forestry Project, and came up with a formula that satisfied both parties: Pay loggers to restore sick forests. In the five years since the early talks over coffee, their idea has grown into a West-wide experiment that may change the way the Forest Service does business. The Flathead Forestry Project's first experiment was the 112-acre Cedar Flats project on the Flathead forest north of town. Fire hadn't been allowed to naturally burn in the area since 1910. Without small, ground-level fires to clear the undergrowth, small trees grew thickly together, shading out wildlife forage and increasing the risk of large fires that burn all the way through the forest canopy. With $120,000 in grant money, and support from the local forest staff, the Flathead Forestry Project designed a project to restore the forest to a patchwork of old growth and younger trees. A panel of three Forest Service staffers and four Forestry Project members reviewed proposals from nine contractors without seeing the price tags, and chose a handful of finalists. "There was everything from a one-man show to a horse logger to a company with the most advanced equipment," said Gary Dahlgren, acting district ranger at Tally Lake, who was one of those reviewing the projects. "Any one of the systems was capable of doing the job." The committee then looked at what each operation would charge to do the job, and chose two companies. The first was selective "eco-logger" Bob Love (HCN, 11/24/97). 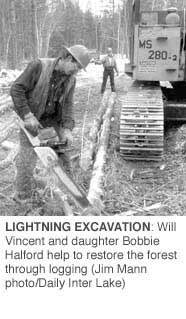 The second was a father-daughter team called Lightning Excavation. Loggers finished the 73-acre thinning projects last winter, and where trees were once crowded together, pines now stand 10 to 12 feet apart, creating a park-like setting. The space will allow the trees to grow taller and thicker, and give undergrowth room to grow, providing food for elk, deer and, perhaps, grizzly bears and wolves. The Forestry Project paid the contractors $97,200 to do the job, and the Forest Service sold the timber for about $75,000. The Flathead Forestry Project didn't stop at Cedar Flats. In 1995, the group had drafted a bill that would set up a national stewardship contract program. The bill made little headway in Congress that year, but was reborn in 1998 with some changes and passed as a rider attached to an appropriations bill. It allows the Forest Service to enter into 23 contracts across the West. "Timber cuts, streamside reclamation, recreation and wildlife habitat will all be melded into one contract," explains Perry Brown, dean of the School of Forestry at the University of Montana. One proposal from the Custer National Forest calls for prescribed burning, noxious-weed control and road obliteration on 32,300 acres. Another, on the Beaverhead-Deerlodge Forest, focuses on watershed restoration, stream channel stabilization and the fencing of aspen stands to keep out livestock and wildlife that eat the young trees. Like the Cedar Flats project, some logging will occur on each site, but the logger gets a paycheck based on the forest that remains, not the logs that are taken out. Money the Forest Service makes from selling the logs returns to the local forest's budget to help pay for the project, or others down the road. A new disguise for timber cutting? Not everyone likes the Flathead Forestry Project model. Some environmentalists who have followed the group fear that, like the Quincy Library Group in Northern California, stewardship contracts put land that is owned by every U.S. taxpayer in the hands of small local groups (HCN, 9/29/97). The Forest Service should be focusing on more pressing issues, such as tearing out unneeded roads, according to Keith Hammer of the Swan View Coalition. "The Forest Service has put an incredible amount of time into this project. It's a grand distraction," he says, adding, "The Forest Service doesn't need any help in twisting around the term restoration to mean we need to cut more trees." Bob Schrenk, who oversees stewardship proposals for Region 1, says projects designed to camouflage timber sales will be weeded out. "This will allow us to do quite a bit of work we haven't been able to do before because of budget restraints," he says. "These projects won't ever replace service or timber contracts, but they give us a new tool to accomplish needed work in the forests." The original 23 stewardship contracts will continue through 2000, but the experiment's future is unknown. Last fall, Congress cut funding for the project from an appropriations bill, says Carol Daly with the Flathead Economic Policy Center, who helped raise grant money for the Cedar Flats project. She hopes to convince Congress to fund more contracts next year. The wheels of change are moving too slowly for loggers like Jack Jay in Columbia Falls. He says he has given up any hope that his three children will ever make a living from logging. He encourages them to go to college and find more stable professions. "My own measure of success for the project will be when I see a viable small-sale program once again," he says, "with trees being cut on a regular basis." Mark Matthews writes from Hot Springs, Montana. * Keith Hammer, Swan View Coalition, 406/755-1379.